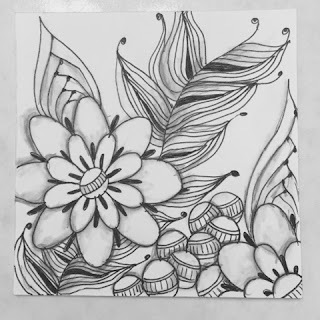 One of the first things that attracted me to Zentangle and all the patterns is how patterns can be used to represent natural things like rocks, flowers, leaves, etc. and when I saw this week's Diva's Challenge, I was excited. I have done several pieces that depict 'nature'. The one you see above was done a year ago. And here is one from my Tangle Journal. And here is one I did last night using Tagh, Jetties, B'tweed, and Featherfall. I have a difficult time using Festherfall, I think it's beautiful but just can not grasp how it's done. Hope you have a great Tuesday!! 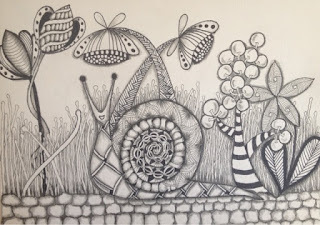 That snail is just gorgeous and the Verdigogh is nicely done too. As for the Challenge tile, what a brilliant use of patterns. Thank you, Margaret! Verdigogh is one my favorites and I use it often! I love all of your work here! I really like the organization in your journal and your Diva tile is lovely! Thanks, Michelle! I try to pick two or three patterns each week to practice..
Tagh, Jetties, B'tweed and Featherfall? Okay, just admit it. You've got fairies working on this stuff with you :D ! I don't know what you're talking about, mostly, but I love the results. Spread those wings, Angelcake! I keep practicing because I just love how beautiful it is! One day, I'll get it! Thanks for stopping by! Wonderful work! Great choice of tangles! Love the tangles you have chosen for this weeks challenge! Lovely art. 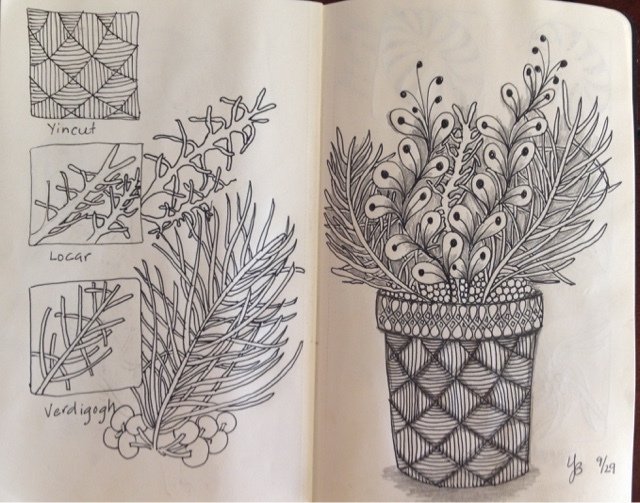 My favorite is the tangle on the pot !! Très joli. j'aime beaucoup le dernier dessin, l'équilibre de sa composition. Very attractive. I like very much the last drawing, the balance of its composition. All tiles are wonderful but I really love your snail one!!! 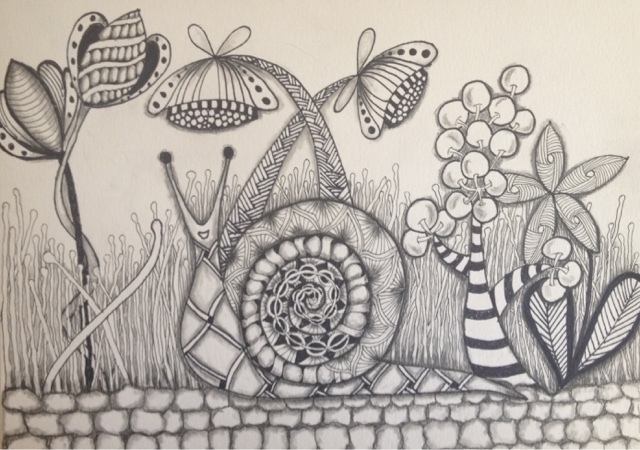 It's so special :-) Great use of patterns for the snail and the flowers and nice contrast and shading, really beautiful. Nicely done and I can see the care you've put into these! Charming pieces. I love the first, quite whimsical piece, the one in the vase is terrific, and I think your Featherfall is done perfectly! Beautiful - this week's piece is like a bouquet. Thank you all so very much! I'm still learning and I love looking at everyone's too! Stunning, truly! Thanks for visiting my blog.